Each frame (#2-9) is .1 second apart. Frame # 1: The left arm is fully extended forward with the shoulder elevated. The left hand is immediately positioned to generate propulsive force. The right arm sculls inward. The right hand has turned over slightly as it dips to produce a sweeping curve inward and upward. The right leg kicks to counter-balance lateral and vertical forces created by the entering left arm and the sweeping right arm. The hyper-plantar flexion of the right foot is remarkable. Frame #2: The left wrist flexes as propulsive force is developed. The right arm continues to accelerate inward and upward. The thumb is on top of the hand in this position. 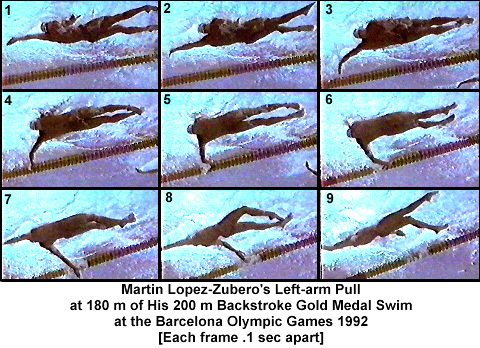 A right leg kick is completed, the head position is stable and low in the water, and the left leg prepares to kick. Frame #3: The left arm is well into its propulsive phase. The left shoulder remains elevated as the upper arm is medially rotated. The left arm bends at the elbow while wrist flexion decreases. The hand/forearm-propelling surface is established. The left leg kicks to assist in hip and shoulder rotation. Frame #4: The left arm is in a classic "elbow-up" position with the upper arm medially rotated. The hand/forearm is positioned to produce a long, primarily horizontal propulsive force. The left leg kicks to counter-balance the recovering right arm and the right shank drops to kick. The right leg prepares to kick. Frame #5: The left upper arm is adducted with little change in the propelling surface. This is a powerful movement. The right leg kicks to counter-balance lateral forces created by the effective left arm. The left leg starts to bend at the knee in preparation for a kick. The hip and shoulder angles to the left are very pronounced. Frame #6: Adduction of the left arm as a propulsive action nears completion. The elbow joint extends and the hand remains deep. The right leg kick is almost completed. Frame #7: The left arm is very deep and beginning an inward sculling action. Because of the depth, the movement path will only be inward and upward. The right arm has entered straight and aligned with the side of the body. The right leg prepares to kick. Frame #8: The left hand sculls inward and upward. The right leg kick has just started. The hyper-plantar flexion of the right ankle places the foot in a very good position to create a backward propulsive component of force. Frame #9: The left arm prepares to exit the water thumb first as the inward sculling movement is completed. The right leg kick is almost completed. The right arm is creating considerable backward propulsive force. In this sequence, the right leg kicks three times while the left leg only kicks once (frames #3-4).